A must for Mexican and African cooking, chili flakes will liven up any dish. Use sparingly in marinara and pizza sauces, and on grilled vegetables and meats. Chilies can be irritating to the eyes and skin, so handle with caution. 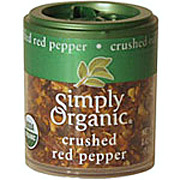 Simply Organic Red Pepper Crushed is shipped in a discrete, unmarked package. Orders are processed immediately and usually take about 3 to 5 working days to be received. We do ask that you try it for 2 to 3 weeks to feel the full effects. Any information received is used only for order processing and shipping purposes. Your information, such as e-mail address, will never be disclosed to a third party.